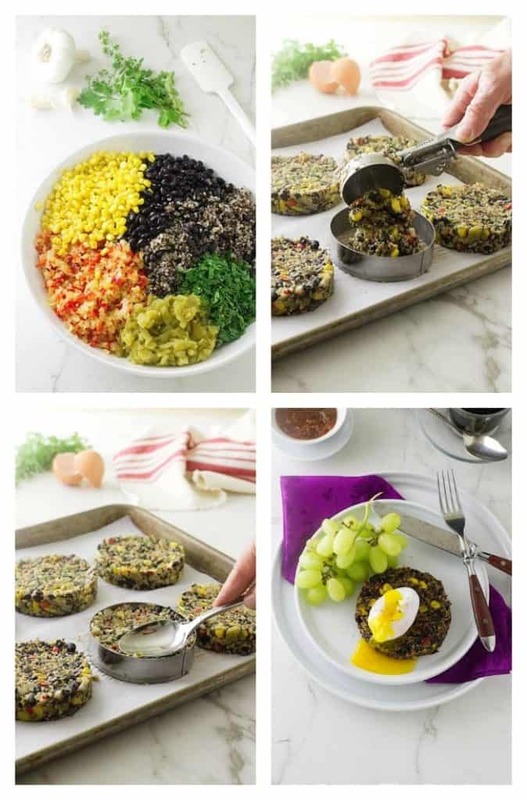 Do a change-up to your breakfast routine with this Southwestern Quinoa-Black Bean Breakfast Burger. The creaminess of a poached egg oozing over the top of this burger is awesomely delicious combined with all the Southwestern flavors of this power-packed breakfast. And, the kick from the chipotle will wake you up and get you moving. America is so blessed to have such a vast melting-pot of cultures and food choices from all over the world. One of our all-time food flavors is from the Mexican and Spanish influence with their Southwestern cuisine. We never get enough of those tacos, fajitas, enchiladas, flan, and warm tortillas…just to list a few. Did I hear you ask,…..“Where’s the Beef?” Aha!….this is a burger but not a HAM-burger and it is so amazingly delicious you won’t even miss the beef. It is a nutritious, low-fat, high protein, high-fiber, good-for-you meatless burger to add to our expanding list of Southwestern favorites. Quinoa is an ancient grain that is actually a seed but treated as a grain. It is a seed-of-many-colors but white, black and red are the most popular. Quinoa is especially high in protein, it is gluten-free and very nutritious and healthy. 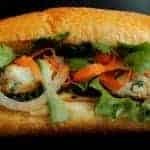 It is a great alternative to rice and very diet-friendly. We like using dry black beans as the blackness of the bean is more prominent than in the canned beans. The darker the color, the better for you. But canned and rinsed black beans is an option and they are more convenient. Black beans are legumes and they are high in protein and fiber plus they are heart-healthy and nutritious. They are an inflammatory-fighter with flavonoids that are in the same category as the blue, red and purple fruits and vegetables. We combined these powerhouse foods with whole kernel corn, onion, garlic, red bell pepper and green chiles. Then we spiced it all up with Southwestern flavors of chipotle, cumin and oregano. We used a ring mold to form the burgers into uniform, four-inch burgers and baked them in the oven. It is super good for breakfast with a poached egg on top. These burgers will keep in the fridge for several days and are freeze-able! 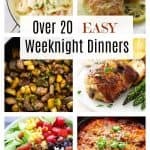 Just pop one in a skillet or microwave to reheat and enjoy. 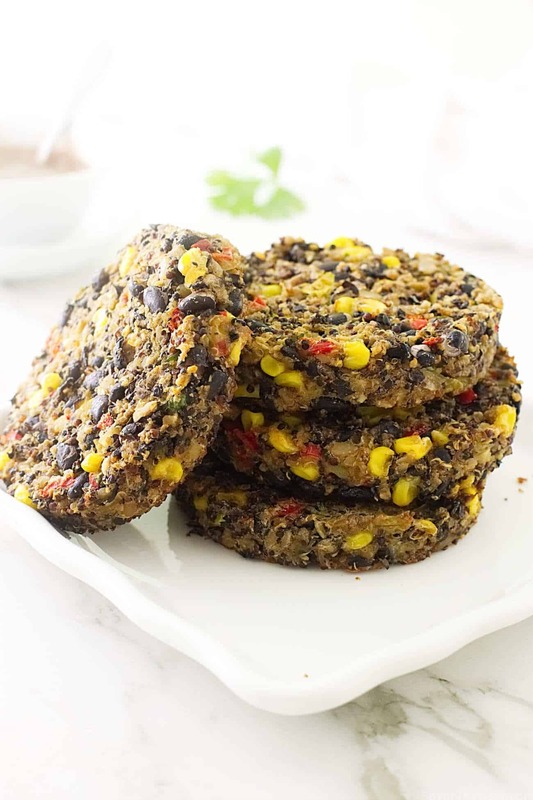 This quinoa-black bean breakfast burger is not just for breakfast. Serve it as part of your Meatless Monday menu or a low-fat veggie burger with sliced tomato, lettuce and salsa on a toasted bun. Enjoy this deliciously healthy, diet-friendly burger today! 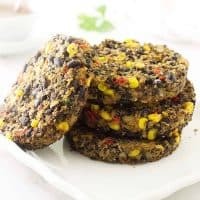 This Southwestern Quinoa-Black Bean Breakfast Burger is power-packed with all the Southwestern flavors that you love including a kick of chipotle to wake you up. In a medium size skillet, set over medium-high heat, add the oil and when it has warmed, add the onion and bell pepper. Cook until slightly soft then add the garlic and cook 30 seconds. Remove the skillet from the heat and allow to cool. Add 1 cup of the black beans to the food processor and pulse to break up the beans. Transfer the beans to a large mixing bowl and add the remaining beans, cooked vegetables, the quinoa, corn, green chiles, cilantro and oregano. Sprinkle the oat flour over the ingredients and add the cumin, salt and pepper. In a small dish, add the egg and the mashed chipotle pepper(s), whisk to combine then drizzle over the ingredients. With a spatula, combine the mixture. Making 1-cup scoops of the mixture shape into 4-inch patties. Place on the prepared baking sheet, brush the tops with melted butter and bake for 30 minutes. Transfer to a wire cooling rack until cool. Fill a medium size saucepan with water and add 1 tablespoon of salt, heat to a simmer, break eggs individually into small dishes and tip each one into the simmering water. 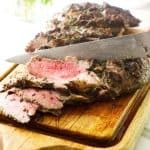 Cook 3-minutes or to desired doneness. Remove eggs individually with a slotted spoon, blotting the bottom of the spoon on a towel to remove excess water. Oats are gluten free and the flour gives structure to the burgers. If unable to find oat flour, add 1 cup of dry oats to either a blender, food processor or spice mill and process finely. If you are strictly gluten free then make certain the oats have not been processed in a factory that also works with gluten type grains. Canned chipotle chilies are powerful, add cautiously and according to your personal taste. If you have remaining chipotle chilies, purée them with the sauce in the can and place tablespoons in small 2-oz. lidded plastic containers and freeze for future use. 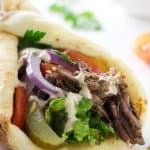 When shaping the mixture into burgers, place a 4-inch round cookie cutter ring on the parchment paper, scoop the mixture inside the ring, smoothing and shaping the burgers. Lift the ring off and proceed to the next burger. 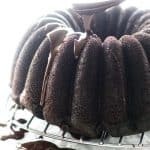 We used 4-inch round English muffin rings as our mold. This recipe will make 8 burgers they will keep in the refrigerator for several days. For freezing, wrap individually in plastic wrap and add them to a closable plastic bag. Adding salt to the egg-poaching water will prevent the eggs from sticking to the bottom of the pan. This is so ironic, but I actually just had something like this for breakfast. I had some black bean quinoa burgers from Trader joe’s and I topped it with an over easy egg! It wasn’t nearly as lovely as yours is, but it sure was delicious! These sound very interesting! I haven’t tried bean burgers yet. I never really had any urge to try them but yours look so good and I love the colors! I think you made me a convert! Yum! 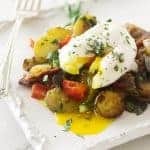 That poached egg looks like the most delicious thing on earth, and I’m surprised how easy is to make them! My sister used to love eggs like this when she was a kid, and my grandma will please her every time, but to my young eyes, it was such a complex process, haha! I still have to give a try to quinoa, I thought it was similar to couscous but I see it’s not! oh yes a poached egg is deceptively easy to make and my favorite way to prepare an egg. 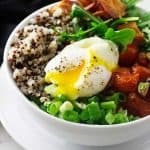 I do hope you give quinoa a try, it is so fast and easy to make. I love the combination of black beans and quinoa. 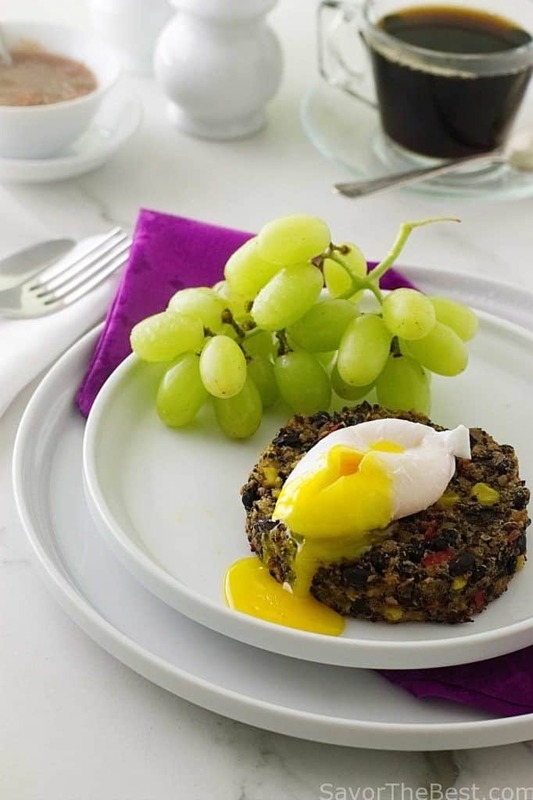 What a great idea for breakfast – love the poached egg on top! I love trying love experimenting different food from different backgrounds. That is what I do when I am on vacation too, I do not eat in fancy restaurant, I eat local, street food to try new stuff. This burger is a must try. The texture is just perfect. So many flavors and yet a healthy option for breakfast. I try to get ideas for breakfast and this is something new, I got to try it !!! This looks like it would satisfy Handsome’s need for a hearty breakfast and my need for a healthy breakfast! Burger for breakfast? Yes please! Love all the healthy stuff in it too! Thanks, Lisa….these are delicious. I have this for breakfast a couple times a week with a poached egg. It only takes a minute for the frozen burger to heat in the microwave. hmm, this is a very interesting recipe. I never thought about doing something like this. But i do eat Southwest omelets, and similar things for breakfast. I’ll have to try it out. Thanks for the idea! This is such a great and healthy breakfast idea! Oh my goodness. Breakfast burger? Genius idea. And I love all the flavours in these! I’ve always been a real-food-for-breakfast type, so this is right up my alley ~ yum!